We’d love your help. 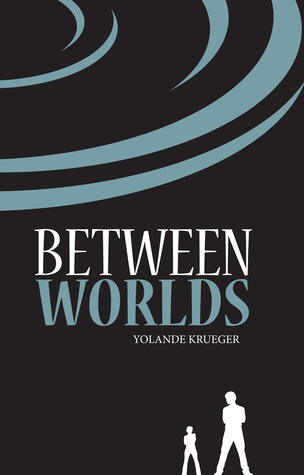 Let us know what’s wrong with this preview of Between Worlds by Yolande Krueger. It only takes a moment to change one’s life, and for Olive Trix that moment happened when she met Dah-vid. In the valley, her powers grew, waiting to be unleashed. In the Brew, magic was happening to all that passed through its doors. In her arms, she held the Bean. In the main house, a visitor came a knocking. In the bottle, a message formed. In the mountains, a portal opened. I It only takes a moment to change one’s life, and for Olive Trix that moment happened when she met Dah-vid. Inside her, was something Between Worlds! This book actually started out really great! The idea is different, the characters were interesting, and the dog stole the show. Then, in the middle, everything fell flat. The story became ridiculous, insta-love (my biggest literary pet peeve) reared its ugly head, and then a Council of Magic was mentioned at the very end when the book made it clear there were few witches/warlocks and they mostly kept to themselves. It is also in dire need of some editing, but it was free, so I can't really compl This book actually started out really great! The idea is different, the characters were interesting, and the dog stole the show. Then, in the middle, everything fell flat. The story became ridiculous, insta-love (my biggest literary pet peeve) reared its ugly head, and then a Council of Magic was mentioned at the very end when the book made it clear there were few witches/warlocks and they mostly kept to themselves. I feel obligated to say that this will be a slightly biased review, as I admire the author very much, and consider her a wonderful friend. I find that most people enjoy entertainment when they find similarities, or relatable topics to their individual lives. As an example, lyrics from a song can parallel the exact situation you are in, therefore you will relate and feel more attached to that particular song. I found that with this book, I could find so many Things to relate to, which made it com I feel obligated to say that this will be a slightly biased review, as I admire the author very much, and consider her a wonderful friend. I found that with this book, I could find so many Things to relate to, which made it comforting and entertaining. The places mentioned in the book are real places that I've been to, and some of the characters are casually based off people that I know. Because of these factors, I felt this book was very special. As for the plot, I felt that It could've been more detailed. The book was very short, and I'm use to reading large fantasy books with newly created worlds and detailed magical beings. "Between Worlds" has the potential to be epic, if it had more details, more information about the characters, and a slower development. It felt a bit rushed, and I wish I could learn more about Sophie and Julianna's personalities as well as more background and history about the Giants. On a last note, I loved the setting of the coffee house, soy bean, and the originality of the magic that was created in this book. I am definitely looking forward to reading her second installment of the Trix-ology series, named "Worlds Apart", as the previous book left on a cliffhanger. I began reading Between Worlds, by Yolande Krueger, a few days ago. The story is an easy read. I did find the beginning to be a bit scattered and it didn’t flow to well. Throughout the story there seemed to be places that had a lot of details that seemed to not fit right, or was put in a middle of a thought. For example, at the beginning of chapter 14 when she was describing Olive’s bedroom. It just felt like the description of the room was to detailed and was unnecessary for the story. With tha I began reading Between Worlds, by Yolande Krueger, a few days ago. The story is an easy read. I did find the beginning to be a bit scattered and it didn’t flow to well. Throughout the story there seemed to be places that had a lot of details that seemed to not fit right, or was put in a middle of a thought. For example, at the beginning of chapter 14 when she was describing Olive’s bedroom. It just felt like the description of the room was to detailed and was unnecessary for the story. With that being said I thought the book was overall pretty good. I found myself wanting to know what was happening with the characters. It was more of a coming of age story for the protagonist than a fantasy story about magic. The story did center mainly around Olive, her feelings for Dah-vid, and them trying to find him. But as I finished the book it appeared that this story was the ‘how it all began’ story. I look forward to see how the characters grow, the direction the relationship between Olive and Dah-vid will go, and the next part to this emerging series. I would recommend this book. Its an easy book to read that is also enjoyable. Like I said before there were some issues with the flow of the details, but nothing that takes away from the enjoyment of the overall story. I was provided a copy of this ebook in exchange for an honest review. Between Worlds by Yolande Krueger: Good quick read. This young adult fantasy will allow you to escape into a world with magic, mystery, laughter and love. Although there was some parts that did feel a little scattered or out of order, if you just stick with it, it all makes sense in the end. My favorite character was Soy Bean, the dog. I loved the way Yolande wrote about getting into all the all those magical concoctions and h I was provided a copy of this ebook in exchange for an honest review. My favorite character was Soy Bean, the dog. I loved the way Yolande wrote about getting into all the all those magical concoctions and how he worried about his owner Olivia. His special connection to Dah-vid (the giant) was nice as well. The love story between Olivia and Dah-vid did seem a little forced, but given the length of the book, it’s understandable. I mean, this is a magical story why shouldn’t there be love at first sight? As the first book, it was good. Would have been better if "wondering" had been properly spelled wandering. Set up was good but it will take more books before it can be determined if the witches, warlocks, giants and magic are well thought out and presented. I wasn't so sure when I started the book but started to get into it pretty early on. I enjoyed the characters and especially the addition of giants. There aren't enough giants in books about witches! Fun YA. I would recommend it for YA and adults who like to read YA. My only concern going forward - The girl with extra powers she didn't know about saving Earth has been done SO MUCH. Wish this could be going in a different direction. Just the teens navigating in a mundane world dealing with teen st I wasn't so sure when I started the book but started to get into it pretty early on. I enjoyed the characters and especially the addition of giants. There aren't enough giants in books about witches! Fun YA. I would recommend it for YA and adults who like to read YA. I enjoyed it until the end...which wasn't an ending, but a hook for book two. I actually double checked that there wasn't a problem with my copy it ended so...mid way thru the story!!! I have no problem leading into the next story, but I do feel you should compete the book you are in first! Otherwise, it has potential and I am sort of looking forward to book two....but if doesn't have a beginning, middle, and an end I might not come back for any other by this author! Although this book is not in the genre that I usually read, I would highly recommend it for teens (and adults who enjoy teen fiction). I found the characters quirky but lovable and was especially drawn to the bumbling Wildorf and the darling dog Soy Bean. I am eagerly awaiting a sequel after the cliff hanger of the last few pages and am excited to see what worlds Olive ends up in next. I started to read this but it was so disjointed and provincial. The first few pages felt as though I was proof reading my child's contrived, mediocre school assignment. I may try again later but at this point, there are so many other free reading options (many of which that have proven to be wonderful) that there is no point in forcing myself to continue. The plot was very interesting. I liked the world that the author set up. It did seem like it ended abruptly though. The powers and magic that the author presented was cool. Although it seemed like there was a lot of loose ends and bits that were never covered leaving dead ends and disappointment. The writing was... interesting. I found this book enjoyable and short, I finished in a day. One thing I didn't like is it left me hanging right when I got in to it and there isn't a sequel (hopefully one is to come). Overall I would recommend this book. i won this book on firstreads. It took you into a magical world that was fun and interesting. I'm sure there are more books to come since it seemed to leave you hanging. I hope to learn more about Olive and her Giant, Dah-vid. I would recommend this book to young adults and adults! In this world, there is no make-believe. Just because you haven’t seen something doesn’t mean that it doesn’t exist. Read the rest of my review on my blog! A short fantasy read for older YA that paves the way for a saga to come . This story lacks an ending and was more like a prelude to something larger. It introduced characters, giving them basic outlines without going too deeply into their stories. An interesting tease. Looking forward to this SASKATCHEWAN novel!!!!!! This is a quirky, humorous book that I recommend, looking forward to more from this author!! Thank you to GoodReads First reads for a copy! I hope there's more to come!!! I really liked getting to know the characters and what they were about. I was born and raised in Regina, Saskatchewan but have also lived in Ontario and Alberta. As a child, I wanted nothing more than to escape this world and live in some kind of fantasy. I was captivated by movies like Labyrinth (1986), where Jareth the Goblin King pulls Sarah into his labyrinth, trying to make her forget her past and be trapped forever. I must admit, at the time I thought Jareth, pl I was born and raised in Regina, Saskatchewan but have also lived in Ontario and Alberta. As a child, I wanted nothing more than to escape this world and live in some kind of fantasy. I was captivated by movies like Labyrinth (1986), where Jareth the Goblin King pulls Sarah into his labyrinth, trying to make her forget her past and be trapped forever. I must admit, at the time I thought Jareth, played by David Bowie, was dreamy–spandex and all! Over the years, I fell in love with many make-believe men and their stories of adventure. I wished for Conan, played by Arnold Schwarzenegger to save me from some kind of serpentine beast, for Madmartigan, played by a long-haired, dirty Val Kilmer, to defend me from raiders sent by the evil Queen Bavmorda, or for bearded Commander William T. Ricker, played by Jonathan Franks, to beam me aboard. However, as time passed, it became apparent that no Goblin King was coming to take me away, so it was up to me to create my own stories filled with adventure and superheroes. I attended the Alberta College of Art and Design, where I majored in glass blowing. After many burns, slivers, and cuts, I obtained a Bachelor of Fine Arts with distinction. Today, I work as an artist, creating pieces out of clay and fibre. I now live in Calgary, Alberta with my Toy Manchester Terrier named Soy Bean. I’ve never forgotten over the years the wonderful adventures my imagination has taken me on, and for this reason I started to write. I’ve always found books, movies and video games a real escape, and I wanted to create something that could help others escape as well. I published my first book, Between Worlds, in 2012. This book was brought to life with inspiration from my friends and family, as well as my little dog. I wanted to create a world that was filled with magic, yet still believable. I am currently working on my second book. It will continue to tell the story of Olive Trix, one filled with imagination, magic, and make believe. And who knows, maybe this story will go where no story has gone before.